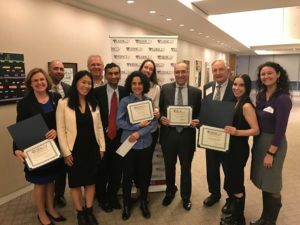 The Harvard Business School Club of New York (HBSCNY)’s Community Partners program awarded $40K to four NYC nonprofits at its bi-annual Leadership Awards presentation Thursday, April 27 at the UJA Federation of New York. Girls Write Now, LaGuardia Community College, MESA Charter High School and New York Sun Works were all honored. Additionally, Harvard Business School Professor Kash Rangan conducted a case study focusing on KaBOOM! and this national nonprofit’s efforts to scale operations to fulfill its mission to have a play area within walking distance of every child in America. New York Sun Works won the “Gold” Community Partners Leadership Award and a $25,000 donation. The organization builds innovative hydroponic farming labs to teach environmental responsibility and proficiency in STEM fields in NYC schools. Math, Engineering, and Science Academy (MESA) Charter High School won the “Silver” Leadership Award and a $10,000 donation. MESA, located in Bushwick, is a college preparatory school with a focus on science, technology, engineering, and mathematics. Girls Write Now and LaGuardia Community College won the “Bronze” Leadership Award and the organizations will spilt a $5,000 donation. Girls Write Now mentors underserved young women to find their voices through the power of writing and community. LaGuardia Community College is a two-year community college located in Long Island City with the mission of educating one of the most diverse student populations in the country to become critical thinkers and socially responsible citizens. HBSCNY Community Partners launched the Leadership Awards in 2015 to recognize NYC area nonprofit organizations that have demonstrated excellence in leadership and organizational development, and in applying best practices to expand their impact in their served communities. Only past Community Partners clients are eligible to apply for the Award. Past winners include Per Scholas (Gold), Bronx River Alliance (Silver), Lower East Side Tenement Museum (Bronze) and New York City Gay and Lesbian Anti-Violence Project (Bronze). About Harvard Business School Club of New York Community Partners: Community Partners provides HBS alumni in NYC with volunteer opportunities to apply their business skills and make meaningful contributions to the local nonprofit community. From July 2015 to June 2016, nearly 175 alumni volunteers served on 45 different projects for NYC nonprofits, and delivered the equivalent of $4.5 million in pro-bono consulting services to these organizations. Community Partners projects are organized across four Interest Groups: Arts & Culture, Education, Environment & Health and Social Services. About Harvard Business School Club of New York (HBSCNY): HBSCNY’s mission is to be HBS in New York: Engaging Alumni, Impacting Community, and Fostering Leadership and Lifelong Learning. HBSCNY’s programs provide the opportunity for all alumni, at all ages and all career stages to work together around common passions and to add value to their lives and their community. For more information, visit hbscny.org.